When your turn begins, gain 1credit if you have 2 or more unused MU. After playing around with this card abit it's best described as Underworld Contact +1 & i am not just referring to its cost. At first glance it looks abit worse with the higher cost both cards require stuff to work 2 in one case 2 in the other. 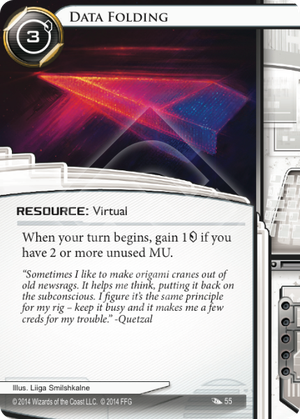 However this is untrue as the difference is no runner has 2 to start with (at time of writing) so you need at least one other card for Underworld Contact to work but all runners starts with at least 4 spare so this card doesn't actually need any other cards to function. This alone makes Data Folding better than Underworld Contact especially if you factor in deck slots and cost for the other card also. You can even use this happily with a regular rig 3 programs and a console or Chaos Theory: Wünderkind. is actually easy to keep free with only minor +. Drip econ that never run's out. Works from Turn 1 with no Setup. An easy fit if theirs nothing you want to use that extra MU on. Can be shut down or restrict what programs you can play. Data Folding: gains 8 credits in eight turns. Turns off when you start installing programs, unless you also spend credits and cards increasing your memory well beyond what you need for your rig. I've been running 3 of these and 3 Underworld Contact in a Sunny deck and it's honestly ridiculous. Best case scenario, you get these set up early game, and you're making 3-6 credits every turn, clickless, thanks to Sunny's breakers never taking up MU space. With Security Nexus, you've got 3 MU outside your breakers to work with for stuff like Datasucker. Add Sure Gamble and Daily Casts and you've got yourself one hell of an economy. Just watch out for The All-Seeing I.